New York (AFP) – Fur fluffed, coats sleeked and tails a-quiver, thousands of four-legged hopefuls squared off Monday for perhaps the canine world’s most prestigious honor, as the Westminster Dog Show kicked off in New York. 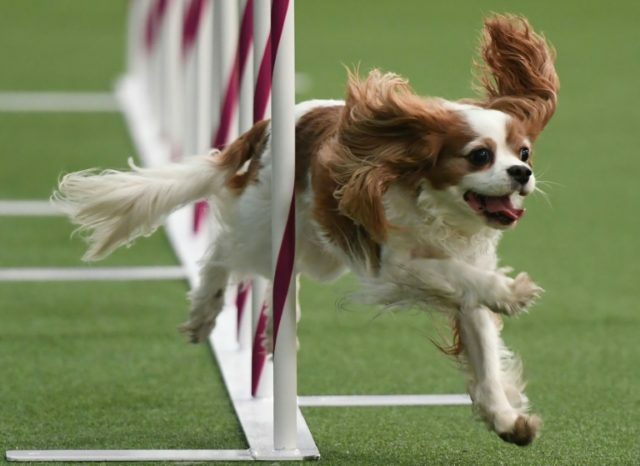 The 142nd installment of the storied contest, the oldest continuously run US sporting event after the Kentucky Derby, culminates Tuesday night at Madison Square Garden with the selection of “Best in Show” among the 2,800 dogs in competition. The first stage began early Monday at a showing area near the Hudson River, with judges picking champs among such prominent breeds as the German Shepherd and French Bulldog, as well as lesser known ones like the Portuguese Podengo Pequenos. Handler Bruce Schultz travelled from San Diego with a cohort of eight dogs ranging in size from the petite Cavalier King Charles Spaniel to the Anatolian Shepherd and Bloodhound, both over 100 pounds. “We took three separate flights and everything to get all the dogs in here,” he said. Ohio-based Nina Fetter is also showing eight dogs — running the gamut in size, shape and coiffure from the American Hairless Terrier to the Komondor, whose mop-like, all-white coat is a reliable scene-stealer. Michigan handler Doug Belter’s candidates this year include a Wire Fox Terrier and a Beagle, with whom he drove for 11 hours to get to New York. Show dogs are judged on the basis of how well they comport with breed standards. The beagle, Belter explained, must be presented in a much “softer” way than its pricklier terrier colleague. “If a beagle looks at you and you don’t melt, it’s not right,” he said. The fox terrier, by contrast, is supposed to show with hauteur and “almost a harsh look” in the eyes, consistent with its heritage as an animal bred to hunt foxes. Belter presents most breeds, but generally refers so-called Toy breeds — such as Chihuahuas and Pugs — to handlers who specialize in smaller dogs. He also avoids Poodles, which require an inordinate amount of shaving and primping. Professional handlers are a fixture of the dog show circuit, which runs year-round. To show at Westminster, they charge up to $500 per dog, plus expenses, compared with $150 or $250 at smaller shows. Many professionals are second- and third-generation show dog people, while others grew up around dogs in other roles, such as hunting or protecting cattle. Hiring a professional handler is a way to ensure a dog is adequately groomed and learns the basics of the ring, such as walking in a straight line, said Gail Miller Bisher, communications director for the Westminster show. Stephen Cabral, a Los Angeles-area professional handler, used to work full time in health care and show dogs on weekends. Nine years ago, he retired from his job of managing radiology tests and building MRI imaging machines to spend more time with his family — and devote himself to shows, driving across the country over four days this year with two dogs. “You do it for the love,” he said.